Hogarth’s Wildlife and Animal Removal specializes in Canada Geese removal. The Canada Goose is a large species of bird most notorious for their black head and neck. They have white feathers that extend from their cheeks under their chin, and a brown body. These geese are native to the Arctic and temperate regions of North America but some do fly south in the fall. Their lifespan is anywhere from 10-24 years in the wild. Canada Geese are a nuisance bird for golf courses, parks, cemeteries, sports fields, and occasionally on certain bodies of water. 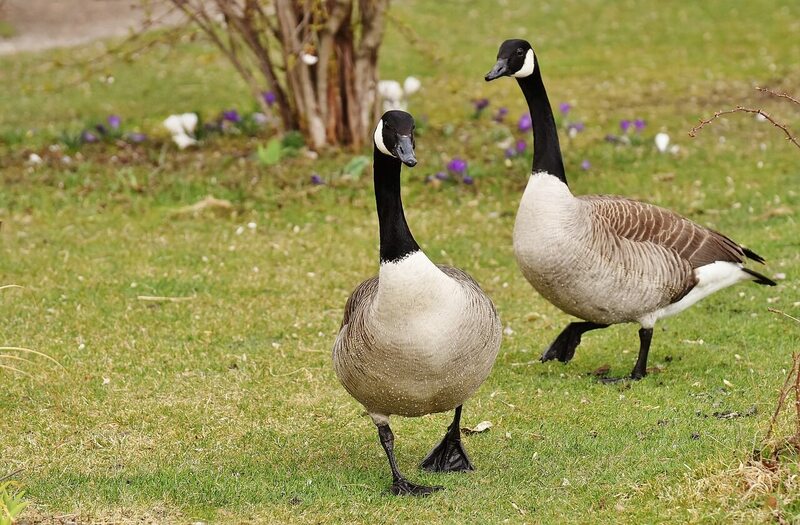 Geese gravitate toward regularly fertilized and maintained lawns, especially those of Kentucky Blue grass. Their feces and urine make a visual mess, and can pose as a potential threat to water quality. One goose can defecate 1-3 lbs. per day! These geese live in large flocks called roosts and reach reproduction age by their 2nd year. 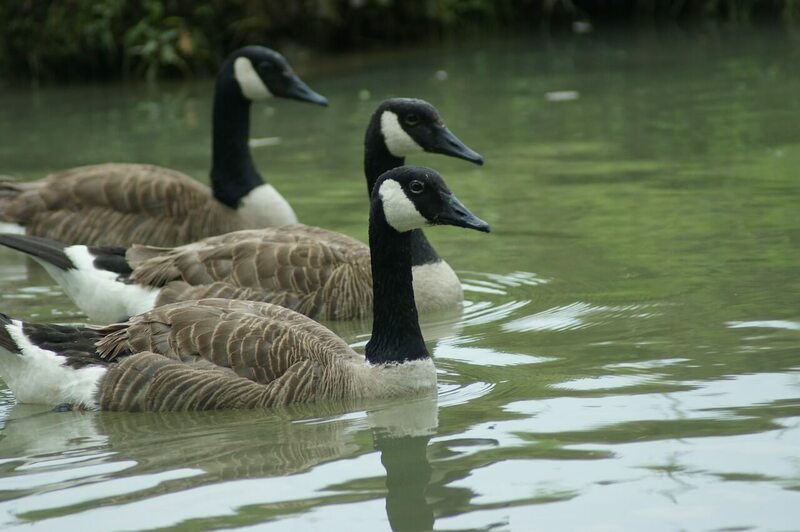 A female Canada Goose can can produce 1-50 goslings each lay! Nesting females can become quite aggressive toward humans or other animals. Juvenile Canada Geese tend to come back to where they learn to fly; this is why consistency becomes key in eradication. Canada Geese do have a permitted hunting season, however outside of the season it is best to use herding dogs to eradicate the issue. 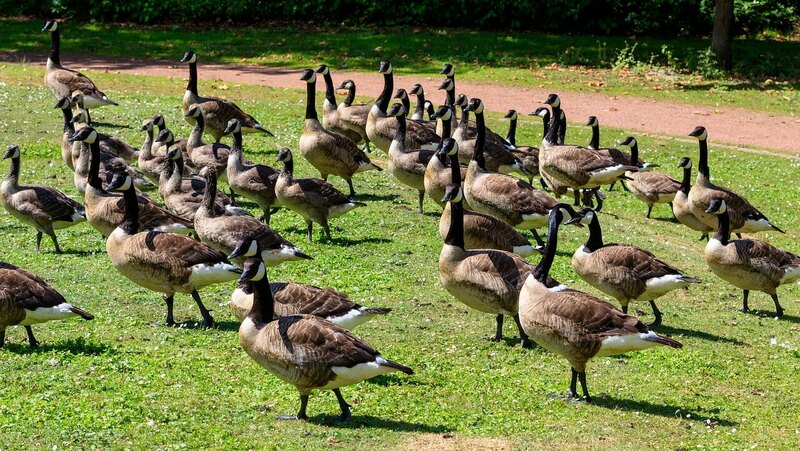 Noisemakers and other persistent, consistent deterrents will ensure a flock of Canada Geese does not return. This must be on a consistent, even yearly, basis if the property seems to be a hot spot for Canada Geese. Hogarth’s Pest Control and Wildlife Company is NWCOA-certified for Geese removal, and has a Border Collie on staff— an ideal tool for these types of jobs.